It is hard to review a match watched between 2 and 4am on a small Ipad screen, but let’s try to analyse the game and see whether we can pull some more conclusions. Holding continues to look very promising. Part of me thinks he is too young to play a big part in the coming season, and another part feels he is the Max Verstappen of our team: level headed, confident, fearless and very, very talented. He will be 21 next month so he is not that young anymore, and if he were to play with the likes of Cech, Koz and Nacho, who can guide and coach him, he could do really well from the start of his Arsenal career. Arsene says he wants to add experience in the CB position but young Rob will be adding a lot of food for thought for him at the moment. Holding did not have a perfect game but his composure, passing and drive are very exciting; and he scored a fine goal to get us in front early on as well. Stuff of dreams right now and let’s hope he will keep it up. The return of Cazorla, combined with Xhaka and Coquelin behind him, was a joy to watch. He clearly was enjoying himself and produced some fine attacking passes. It was surprising to see Xhaka play quite high up the pitch regularly, and he also produced some excellent through-balls, especially to our full backs. At times I struggled to see whether it was Santi or Xhaka who produced the through-ball or classy forward pass, but it is really good to see that we had more than one creative provider on the pitch with the King of Assists still not in action. We are blessed with excellent goalkeepers. Cech is such a calming influence and his experience on and off the pitch is vital for us. But Ospina is not far behind and I hope Wenger can keep him motivated to stay at least another year. Ospina, just like Cech, may let in the odd stoppable goal, but his presence and professionalism have a calming impact on his fellow players and that goes a long way. Martinez also looked tidy in the second half. Ox scored a peach of a goal, the sort of cracker we know he is capable of. We have to see whether he can score regularly against tougher competition but this is a very promising start to the pre-season for AOC. At the moment, he is winning the battle for the other ‘midwing’ position – Alexis will of course take one as soon as he returns – from the likes of Iwobi and Campbell. The latter two looked a bit flat, or maybe I should say ‘ineffectual’, against Chivas. I remain skeptical about the Ox’s chances to claim a first team spot this season, but his attitude, directness and fitness levels have been impressive. Campbell and Iwobi have to raise their game. Theo positioned himself a lot better, just a shame his finishing was well below par once again. It must have been a dagger in the heart for him when Akpom scored so soon after he came on. Akpom did not necessarily impress that much either last night, but he did the thing that matters most in football and that is of course putting the leather over the line. I see Akpom as a traditional CF who looks more towards getting on the goal sheet than helping out the team constantly ala Giroud. But he has an eye for goal and the coolness to take his opportunities, which we cannot pooh-pooh…. another headache developing for Arsene: include in squad or send out on loan again? Theo, on the other hand, needs a goal, or at least an assist, very, very badly right now. I liked our aggression in midfield. 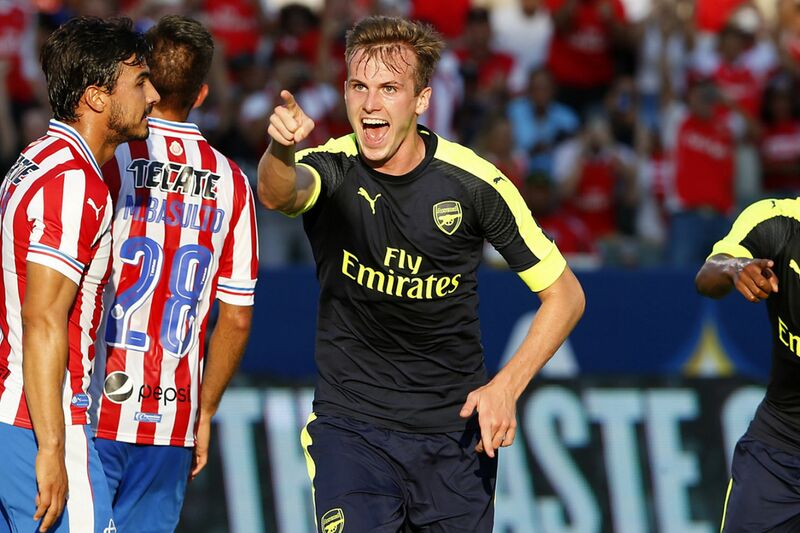 Especially in the first half, there was a fierce and welcome battle in a congested midfield between the Chivas and Arsenal midfielders. Both Coq and Xhaka were strong and fought aggressively for midfield dominance. Francis and Granit were still a bit rusty and gave away too many free-kicks, but I really liked the physicality of their play. This is just what we will need in the PL to dominate teams in the midfield area. Add Elneny to the mix, who had another fine 45 minutes, and we have a really strong midfield that will provide the axis around which our game can flourish. Debuchy played with passion and aggression, which brought us a goal and cost us a penalty. I don’t mind the latter. I want to see Matthieu give his all and fight for his position and that is exactly what he was doing yesterday. Good man. And the assist for Akpom’s goal was very good: well placed and kept on the ground to make it easy for the CF to finish. I want him to stay and fight with Bellerin for the FB position. Mesut was in da House. I know we are all desperately scanning the sport websites for news about new signings, but let’s also not forget the importance of keeping this continuously improving squad together. Seeing Mesut supporting the boys in the stands put a smile on my face. I want him to be well rested before he starts playing for us again, but I cannot wait to see him back and work alongside the likes of Xhaka, Elneny, Coquelin and Santi, to name but a few. By TotalArsenal. — Thanking The Mirror for pictures. This entry was posted in match review and tagged Akpom, Arsenal, Arsene Wenger, Debuchy, friendly, Holding, Match Eight Positives, match report, The Ox. Bookmark the permalink. Theo simply doesn’t have the heart or hunger to improve and succeed. Holding played well, but I feel that he moves up too much. Of he is to play against premiere league opposition, he has to play deeper and not move up too much. Ox is one who likes lots of space and Chivas gave us plenty of space due to their smaller size. Theo is one for the wings, unless he gets his shots on target better. I felt that we play a more direct footy compared to last season, and that is good for us for a start. Bring back the first teamers and we should be commanding. Walcot should re-think his choice. That is the only thing going to kill his carrier. It’s not yet late for him to realise he is not a CF and correct the mistake. He does best when he runs from the wings, prefarably right wing. He was at his peek tearing down defence with his runs and even scoring quality goals. But ever since he demanded for a central role, that marked the begining of his flop. Re-watch his games in those two positions and compare. You are right TA, 2.00am kick offs do not help the analytical process one bit. But a grand job done, whilst still remembering these are pre-season games. Top man! I think we can all agree that these three friendlies have provided us with more meaningful games, as well as entertaining spectacles? I am going to just add a little to each of your points, as there were too many other aspects to go into. 1,- Holding: I think it was clear that AW had in mind to use Per in every game, and oversee the young contenders; Holding, Chamber, and Bielik. That went out of the window with his injury, and with Kos unavailable, Gabriel(tonsillitis? ), it has meant for the last two games they have had to rely purely on their own level of competence. So from that point of view I think all three have done remarkably well, and if push come to shove, any one of the trio could step and assist a more experience partner. I don’t go along with the criticism that Chambers has had, and given the stick Bielik was facing in the Under 21’s re mistakes at CB, I can see opportunities for both of them this season. Holding is best placed, but with Kos it raises the same issues as Kos with Gabriel? Which is why the search is on for an experienced ‘leader’. (I gave my thoughts on the TW at the backend of two posts ago, if any of you are interested). 2,- Return of Santi Cazorla was nice to see, but alas not going to be fit for the ‘Pool game, nor is Wilshere, which temporarily eases the problem of who to select in midfield. It is all very well having the numbers, but these jigsaw pieces do not all fit together. But a fit Santi will be a bonus without doubt. He should get one more outing before the season starts, and he should come on from this opener, which was very good considering his time out. 3,- GK’s in abundance. Personally, I think Ospina will get offers before the TW closes, as there seems to be a knock on shuffle going on, with Man C’s Hart the likely catalyst? A fit Cech, a capable Martinez being pressed by the impressive Macey not far behind, I think we could cope in the short term? 5,- Theo is slowly getting there, and this his best game so far. Like the above, his difficulty is finding a position to hold down. The market may decide his fate, and a move may be best for both parties. 10 out of 10 for getting his head down and working his way through it. Akpom could stick around. I have been more impressed with him since his first outing. My view then was he was heading for the Ox route of last season, trying to over impress. It was all ‘self’. ‘Look, I can muscle my way round these CB’s’ ‘Look, I can show aggression by fouling players because I want the ball’ … What he did not do was show any movement for the team. Since then, he has really picked up the baton and gone about it in the right way. Movement, showing himself as available for a pass. Decoy runs, the lot. I would almost say the goals have just been a bonus. I just hope he can keep that thought in mind, as we progress to the first game of the season? Who knows, he might find himself on the team sheet by merit, and not by lack of alternatives? 6,- Aggression in midfield is one thing, but repeating fouls one after another will not go down well in the league games. Totally unnecessary fouls by tackling from behind, going through the player to get the ball, to me was another sign of a player trying to impress. The truth is this trio of Coquelin, Elneny, and Xhaka will be reduced to two in most games, and may be only one on some occasions, when it comes to team selection. The ones with the coolest head would get my vote. 7, This is one we may agree to disagree. I think Debuchy is in the shop window, and he knows it. To be fair, this was his best game by far. But from almost scoring himself shortly after making the assist for Akpom, to the total indifference to the (unnecessary) foul in the box, tells me he does not want to be at Arsenal as understudy to Bellerin. Simple as that. 8,- I think the two premises you make here are linked TA. Get some success in the former, and success in the latter will follow? Conclusions overall. Well the first half was not great from our point of view, until the goal. The second half was amazing in that, with 6 changes we still were pressing. But when the final 3 changes, yes, 9 in all, we came under pressure. but it was good to see the defence tested. 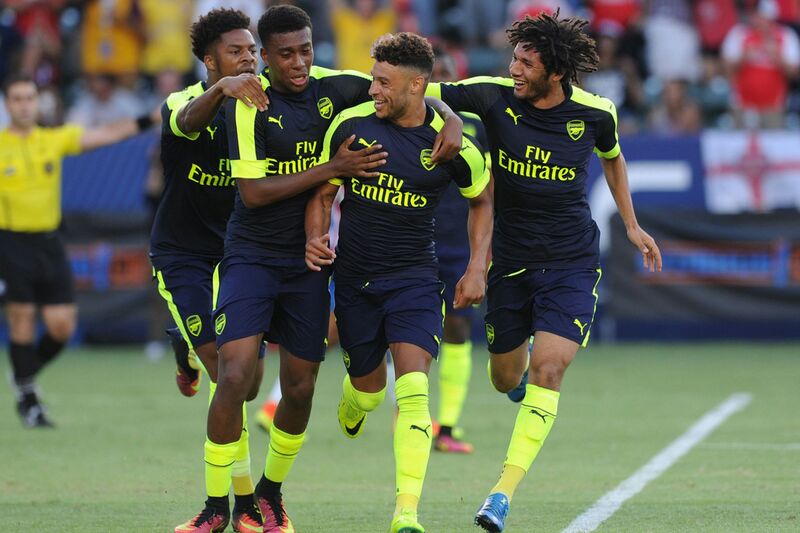 Up front, the loss of Ox and Iwobi was felt much greater than the inclusion of Bielik in defence. But picking up on your points about Iwobi and Campbell TA, I think the former is another suffering position identity. Because he is moving all over the pitch, Ozil like, he is not getting that regular understanding he has with Elneny? Thus less effective. Campbell too, had problems because this part of the game was not so much about us attacking. As for his yellow card late on, Arseblog suggests it may have had more to do with Costa Rica v Mexico than the casual tug back which got others booked earlier. Very lucky to avoid a red card though. He will get another chance before the season starts. I would like to see Jeff RA doing the Alexis bit, rather than the current down the middle thing they are trying. That way, Iwobi could go back to wide right? Willock did not have the same impact this time, partly because the changes altered the balance of play. I have to admit for the first 30 minutes of the first half I was thinking, please, bring on the kids! as it needed their freshness. Zelalem also only shown the odd glimpse, including a tackle! I do not buy into the ‘frail’ thing. He like Willock have got very quick feet, and pass and turn are the way they avoid injuries .. from fair tackles at least. There are a few world class midfielders who have their same wiry frame. For those who might admit to enjoying ‘Strictly Come Dancing’, you will know that the first thing the celebs have to do is develop their core strength. It is the same for these types of players. Getting the spine really strong so the feet can do one thing while the upper body resists any imbalance that may occur. Simples! Agreed on Holding. He really is showing enough to suggest he could be ready to play a role this season. What a great purchase. Don’t agree on Debuchy however. Even that penalty was not aggression. It was initial poor positioning and lack of effort, and when he realised he actually still could get there, then he ran extra hard, but was clumsy. Debuchy does a lot of good things in a game, but if we play him, I bet we’ll see a goal chance from an error from him every time. That’s just where he is right now. Rumours that we’re bidding for a right back from Italy too, and I’d be happy about that. Debuchy is done. Walcott..I don’t know. He just doesn’t have the technique to do well up front. He does have a good finish in his locker, but is short of confidence. And personally, I think he’s been playing terrible football since the end of the 2014-15 season. He’s managed to mask it by scoring goals, but I don’t see him contribute to the team. And now the goals have dried up. I would like him to leave. Might be good for him too. Somehow I feel that Debuchy is trying very hard to win back Wenger and the fans. If not, he would not have came back and would have preferred to stay at the club that loaned him last season. His speed, passing and tackles are not too far away from Bells, which is good considering his age. On top of that, I felt that he has became a more well-rounded player after his loan spell, thus, he might not be ready for time on the bench, but he certainly is fighting for a first team place. So, to conclude, let someone notice what he can do and buy him. If not, let him play in the cup games. Well done on signing Holding! He looks quality, and I’d be happy to see him around the first team this season. I’d still like a senior partner for Kos though, not only yo allow the younger ones to develop at a proper pace but also to cover or injuries that Kos might get. I’m not yet ready to have Gabriel as our senior centre-back. Midfield solid – Santi having a ball and Xhaka looking like the steely midfielder we have needed for ages. Up front I’m not so sure that we had convincing options on show. Promising yes, but not convincing. Ox was the best and he is uo to his usual antics of looking like a superstar in pre-season – he sure needs a good run in the team to establish himself. But I feel we still need a top striker (Laca or Icardi are of course both top quality) and a good wide player. We’ve missed out on one of my top choices in Leroy Sane, but I’d love to see the Brazilian lad Gabriel Jesus come to the Arsenal. I saw him at the FIFA under-20 world cup final last year, and what a player he is. Wow Gerry and Shard, very fine and lengthy additions from both of you. Not much to argue with and let’s agree to disagree re MD. the penalty was a clumsy give away, but he played with real passion and his assist was quality… And he should have scored himself as well. I reckon Gab and Koz will be first CB pair and then Wenger will want cover, and his anticipated time for Per’s recovery may play an important part in his decision re buying another CB. Nice one Samson and agreed. FMJ, AB, Prof Geoff, Pony Eye, Red Arse, OzGunner, Alex, Prince etc etc where are you?